Since its opening in June, the second coming of Triangle Char & Bar has turned heads in Mount Pleasant with a restaurant that takes its inspiration from the original location west of the Cooper. The Triangle Char & Bar has been the social center of the trendy Avlondale section of West Ashley for some five years. A former filling station, its open garage doors and triangular lot at 828 Savannah Highway create an outdoor dining environment like no other. It has become known for its grass-fed beef burgers, won an award for its Sunday brunch and recycles cooking oil and food waste. The new restaurant at 1440 Ben Sawyer Blvd. has the same mantra: waste not, recycle and reinvent. Both Triangle locations are creations of Whitney Rietz Eller, a Mount Pleasant-based designer who earned the International Interior Design Association’s Silver Award for Hospitality Design with the Saltus River Grill in Beaufort. 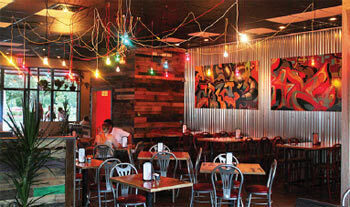 The interiors of both restaurants feature interesting components such as recycled car hoods fabricated into tabletops. Some booths in the new Triangle even come with seat belts. Design elements include shellacked wood pallets repurposed as walls; garage doors with blue trim; and an outdoor lounge area with red couches. Graffiti artists Patch Whisky and Ishmael collaborated on the doors and tabletops, a 40-foot mural that spans the length of the bar and 4-foot by 8-foot panels juxtaposed against corrugated metal walls. In the kitchen, chef Damian Ambs puts his own exciting spin on fresh, innovative dishes such as a seared tuna taco with watermelon pico de gallo; watermelon salad with prosciutto and green goddess dressing; and turkey burgers with raspberry sauce and brie. Ambs’ strong relationships with local farmers and bakers give him access to the freshest seasonal ingredients available. 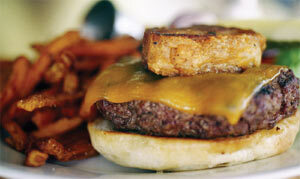 Burgers with a multitude of toppings, such as the General Lee, with pimento cheese and caramelized onions, are a trademark of Triangle, as is a comprehensive list of craft beers from area breweries and beyond. Ambs will put just about anything into an egg roll; one of his favorites combines avocado with sweet Thai chili sauce. Children are mesmerized by the dangling, colored lights as they eat their mini-burgers and are rewarded with cake lollipops and triangular, watermelon popsicles. According to co-owner Skipper Condon, he and partner Scott Long had to find an alternative source of grass-fed beef for the Mount Pleasant Triangle because of the increased volume. McCutchen Farms in Kingstree, S.C., is the supplier. With its high-decibel music, funky design and unique menu, Triangle Char & Bar brings a new look and a new attitude to the Mount Pleasant restaurant scene. For more information, visit www.trianglecharandbar.com. For more information, visit www.TriangleCharAndBar.com.